At Moschino’s recent pre-fall 2019 show, Jeremy Scott spared no expense with the wow factor. Inspired by Rome’s cinematic icon, Federico Fellini, the show took inspiration from his best films. Models walked in outfits directly inspired by the characters, with a backdrop stage decorated to honour La Dolce Vita that combined elements of Baths of Caracalla with 1960’s disco props. 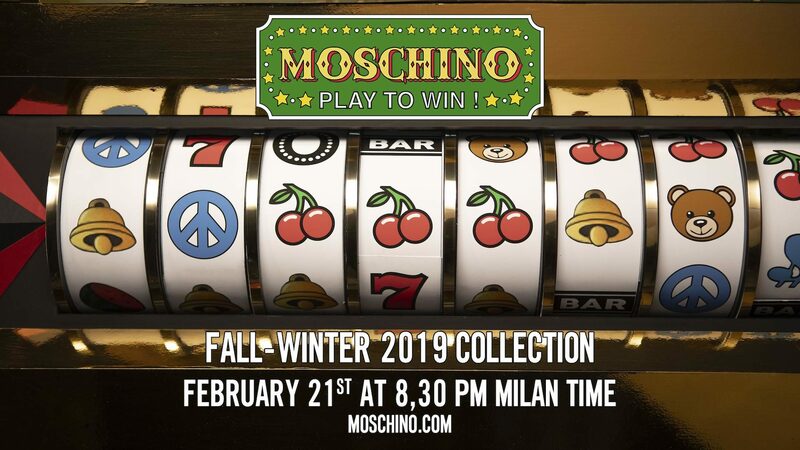 If such past collections (and Scott’s notorious eccentricity) are anything to go by, the upcoming show for Milan Fashion Week is set to be equally kitsch. Judging by the sneak peeks the label has released, this womenswear collection is set to be casino-themed. Preview videos show a jackpot machine with reels spinning, revealing icons that include the label’s signature teddy bear. Catch all the live action in the video below on 22 February, 3.30am (Singapore time).